The United States Court of Appeals for the Fourth Circuit ruled in favor of Wake Forest School of Law’s Appellate Advocacy Clinic in the case of Roudabush v. Milano on Nov. 27, 2017.
numerous questions, according to Professor John Korzen (JD ’91), the clinic’s director. Mickey Herman (JD ’18), Mellan’s Clinic partner, assisted in the preparation for oral argument and joined Mellan at counsel table. Two previous Clinic members, Matt Cloutier (JD ’17) and James Lathrop (JD ’18), wrote the Brief of Appellant for Roudabush last spring, while Professor Korzen wrote the Reply Brief of Appellant over the summer. In his complaint, Roudabush alleges that a Virginia state prison gave various preferences to inmates based on their race, retaliated against him when he complained about the disparate treatment, and thereby violated his constitutional right to equal protection. The three-judge panel that heard Mellan’s argument consisted of Judge Paul Niemeyer of Maryland, Judge James Wynn of North Carolina and Judge William Traxler of South Carolina. The Nov. 27 opinion is per curiam, that is, without a designated author. The opinion reasons that Roudabush sufficiently alleged that the prison’s denial of certain privileges was racially motivated. The Court remanded the case for further proceedings in the District Court. 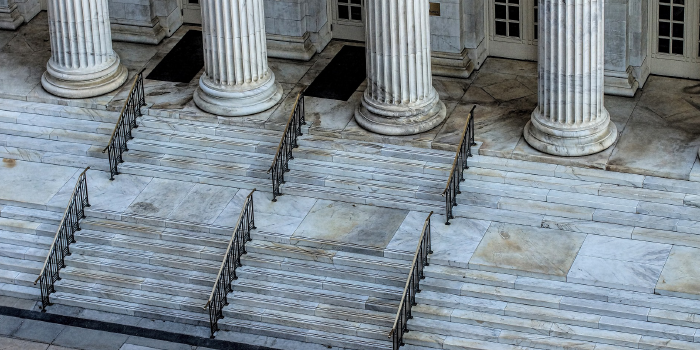 The Appellate Advocacy Clinic also won a prisoner’s appeal in the Fourth Circuit last year, in the case of Fauconier v. Clarke, which involved a prisoner’s claim under the Americans with Disabilities Act. As in Roudabush, the Eastern District of Virginia had dismissed that claim under Rule 12(b)(6).